I always try to use a good quality paint. The type of paint you use depends on what you are painting. There are loads of different options below is a rough guide. For walls and ceilings use a Vinyl Matt emulsion . I usually use a brilliant white for ceilings and choice of colour for walls. This is water based so clean your brushes with water. For bathrooms and kitchens you may want something that is a little more hard wearing for which you can use a Vinyl Silk Emulsion or a Water Based Eggshell These have a slight sheen on them which make it more resistant to water or grease and is easier to wipe clean/dry. 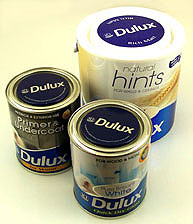 You'll find most paint makers supply a paint which says on the tin it is especially for kitchens and bathrooms. For woodwork you'll need an undercoat and top-coat . Traditionally these have been oil-based paints however now you can get water based paints for woodwork to. Interior door paint will be diiferent from exterior door paint which need to be more hard wearing. Check on the tin or ask at your paint shop and make sure you get the paint that is suitable. Oil-based paints cover well and are hard wearing. The disadvantage is they are solvent based and quite smelly until dry. Check on the tin for the VOC sign(volatile organic compounds). Oil based paint have a high VOC rating which is more damaging to the environment. You will need to clean your brushes with white spirit. Water based based paints may need more coats to get a good finish and aren't so hard wearing. I tend not to use them for exterior exterior woodwork. The advantage is they are easy to apply, don't smell much, and you can clean your brushes with water. So both have pros and cons. Try them and see which one you prefer. So for instance a good paint for exterior doors would be Dulux Weathershield gloss. A hardwearing flexible exterior paint. For interior door paint a good choice would be Dulux Satinwood. Both of those paints are available in oil based or water based versions. For exterior wood you will usually need to use a gloss finish. For internal use the trend is to use less glossy or even matt finishes which are not so hard wearing but look good. Gloss Very shiny finish. Hard wearing and easy to clean. Shiny surface will show up any little imperfections or bad painting. Matt No shine. Looks fab. and is very trendy, but marks very easily. For radiators you can buy a paint especially for them. NB make sure your radiators or turned off before you begin. For stone work or painted bricks you'll need a Masonry paint. It's a bit like interior emulsion but especially formulated to be hard wearing outside. It's water based so you can clean your brushes with water. For exterior wood work as a general rule use an oil-based under coat and and an oil-based gloss top-coat. Follow all the instructions carefully e.g. it is very important to allow adequate ventilation whilst painting and drying.